“Boy Erased” tells the true story of Jared (Lucas Hedges), the son of a Baptist pastor in a small American town, who is outed as gay to his parents (Nicole Kidman and Russell Crowe) at age 19. Jared is faced with an ultimatum: attend a conversion therapy program – or be permanently exiled and shunned by his family, friends, and faith. “Boy Erased” has the unfortunate distinction in coming last in a two horse race as the similar themed “The Miseducation of Cameron Post” which covers almost the exact same story, but told from a female perspective, came out in cinemas last year and has just been released on DVD. Hedges is excellent in the lead role whilst Kidman, Crowe and Joel Edgerton, who as well as appearing is also the writer and director, flit in and out of the story at various points. Unfortunately “Boy Erased” story is not very interesting, the story is slow and at no time does Jared feel trapped in the program which unfortunately removes any tension that Edgerton is trying to bring to the story. 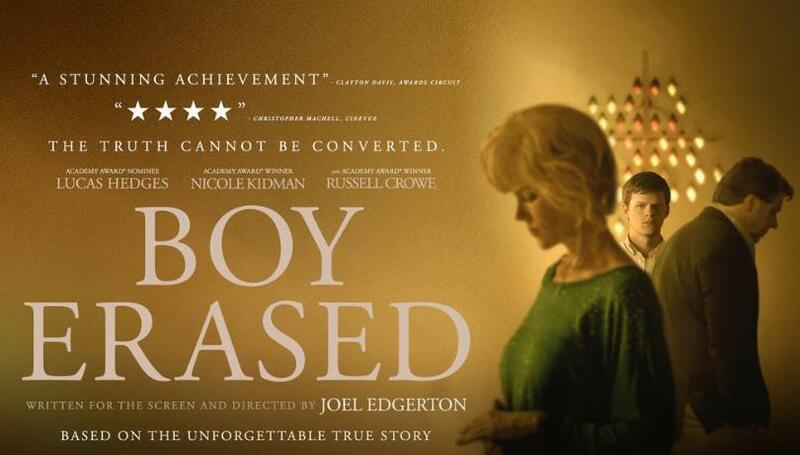 Given the level of talent on show Boy Erased has to go down as something of a disappointment.